VisitorsStudio is a real-time, multi-user, online arena for creative 'many to many' dialogue, interviews, networked performance and collaborative polemic. Through simple and accessible facilities, the VisitorsStudio web-based interface allows users to upload, manipulate and collage their own audio-visual files with others', to remix existing media. Providing a platform for the exploration of collective creativity for both emergent and established artists from a diverse array of geographical locations and social contexts. Designed so anyone in the world can access it from a 56k modem. Participants upload sound files and still/moving images (jpg, png, mp3, flv, swf) to a shared database, mixing and responding to each other's compositions in real-time. Individuals can also chat with each other and are located in the interface by their own dancing-cursors. 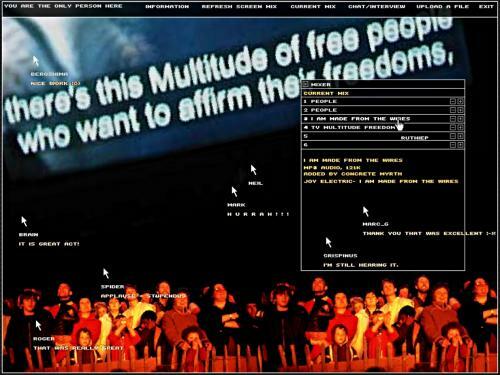 Congratulations to Furtherfield.org and Furtherstudio.org for winning the Grand Prize for netarts 2009 from the Machida City Museum of Graphic Art.